So far, my quest to write at least 1,000 words a day on Vengeance of the Ghost has been successful. Today I finished chapter 8 and got a good start on chapter 9. There's a lot going on in the final chapter of the trilogy so this book might prove to be the longer of the three. I have no doubts that it will be longer than Legacy of the Ghost. The only character whose fate remains unknown to me at this point is Mistress. She has a couple paths that she can travel. Arienna will have some say in that. kaben nine is still hanging around in his torture chamber. His host likes to label all his toys with his brand and kaben nine is no exception. I am enjoying composing this tale. The support characters are proving to be a lot of fun to work with. 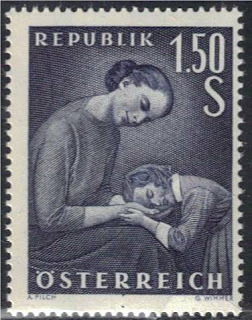 There was a comment on yesterday's blog that requested a picture of my favorite Austrian stamp so far. I had planned to put a stamp here, but for a different reason. The one pictured below is not very valuable. As a matter of fact, it could probably used as postage in Austria without much financial loss. The reason I chose this one is that it was issued on May 8, 1958. This stamp is the same age as I am.